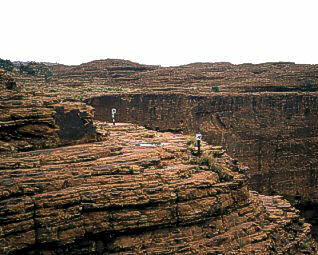 To mention at first: these pictures are made from the canyon rim, but I'd really recommend to do the bottom walk, too. It is beautiful in a different way, see a pic of that one, soon. The beginning of the walk is a bit exausting, so be began early as often in the desert: at sunrise. I think it was around 7 a.m., when we were ontop the mountains and enjoyed the spectacular scene. 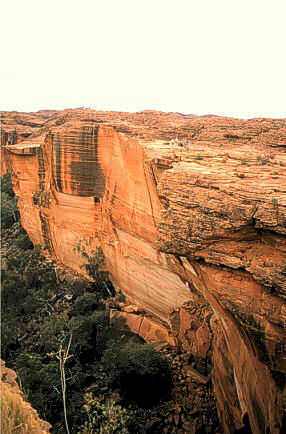 One thing I always enjoyed in Australia: no fences. People are responsible for themselves. So nothing spoils the impression. But on this short track to a lookout I wasn't absolutely sure I'd reject something to hold on. The signs roughly reached my knee, behind them the next solid ground is some 100 m deeper. 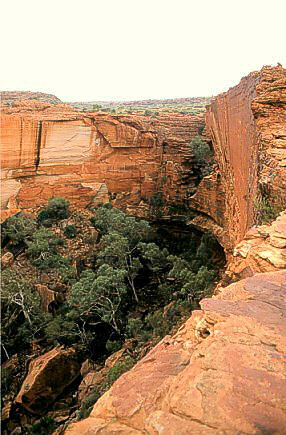 The canyon has an end, the so-called 'Garden of Eden' which looks beautiful, but lacks any rivers of milk or honey. On the opposite rim there are probably the more spectacular views. But it's really hard to tell. The whole rim walk takes about 2 hours, then we went back to the resort to take breakfast.